I want to start by saying I am a Destiny fan. I pre-ordered the legendary edition and have no problems with it. I have been playing since the alpha and have enjoyed the game immensely. But today I am seriously questioning if I will continue to play anymore. Why? Because the newest expansion (this one I will call an expansion as it actually looks to be one content wise) is going to cost more to buy in Australia than the original game. Since when has an expansion ever cost more than the original game? I would much rather be writing about all the great things the expansion has in store for us. New sub classes, new story missions (with actual story included this time round), new strikes and a new raid. All stuff I’m extremely keen to play. Plus I’m sure there will be new trophies/achievements to pickup, which will help entice some of my clan mates back into the game. But instead I’m sitting here writing about how it is going to cost me more than the original game did. And that’s not right. Let’s first look at the offered pricing coming out of the US. 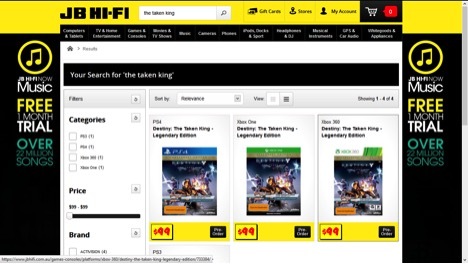 The digital download of taken king is US $40 (AUS $51.77), The “Legendary Edition” is US $60 (AUS $77.65), and lastly the Collector’s Edition is US $80 (AUS $103.53). Also announced today the price for the digital Collector’s Edition items (that’s only the digital items included in the collector’s edition, not the game) US $20 (AUS $25.88). All the prices listed here when converted to Australian currency all look to be pretty reasonable (excluding the digital collector’s items only which I think is overpriced both in the US and Australia) from an average consumer point of view. 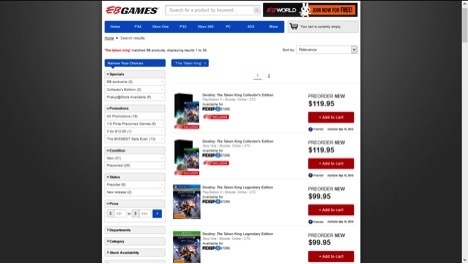 When Destiny launched in September of last year the Standard Edition was AUS $79 at most retailers. For comparison to another AAA title, I purchased Batman: Arkham Knight yesterday for $69 on the PS4 (on special, normal price is $89 at the retailer I went to). So that’s the prices we should be expecting, however Bungie and Activison seem to have a different idea in mind. Those are currently your only digital options Australia. You’re seeing that correct! You can only order the digital collector’s edition. 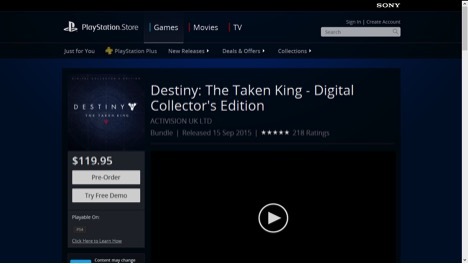 There is currently no way to pre-order a straight up digital download of just “The Taken King” itself. 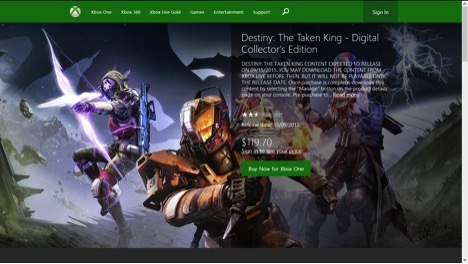 If you select digital download on the Bungie website for your selected console your only options are “coming soon”, except for the Xbox One which does offer a link to the Xbox store but there is no price currently listed. What’s your take: will you be forking out for The Taken King?